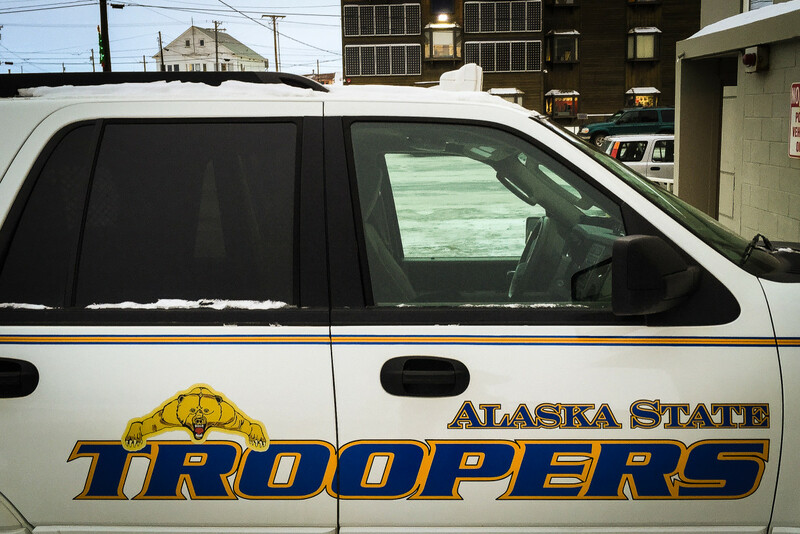 According to Alaska State Troopers (AST), Daniel Ahmasuk of Nome was driving around Glacier Creek Road with an unidentified female passenger on Saturday evening, eluding Nome Police. Charging documents say Samantha Iyapana was the female passenger in the vehicle at the time. Iyapana reported to 911 that she had been assaulted by Ahmasuk and that he was refusing to let her out of the vehicle. Sometime close to 9pm Saturday, the vehicle became stuck in the snow, and Ahmasuk fled on foot. AST responded to the area on snowmachines and arrested Ahmasuk. He was brought to Anvil Mountain Correctional Center (AMCC) and is being held on charges of kidnapping, assault, and failure to stop at the direction of a peace officer, among other alleged crimes. There is no mention of sexual assault related to this incident. Image at top: Alaska State Trooper cruiser. Photo: Matthew F. Smith, KNOM file.